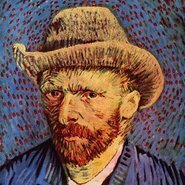 Compared to his relatively slow-growing popularity in France, and even slower in Britain and America, Vincent van Gogh was idolised in Germany from the beginning of the 20th-century. He not only inspired the painters of the groups Die Bruecke and the Blaue Reiter, but through the early publication of his letters in German he acquired the status of a spiritual leader. This only increased after the disaster of the First World War and the end of the German Reich. Beside the expressionist painters who were so obviously influenced by Van Gogh stands the intriguing figure of art critic and collector Julius Meier-Graefe, who in 1922 wrote a Van Gogh 'novel’ about the artist’s life and the need for him as a model of humanity in devastated times. The effect of this intense interest in Van Gogh carried over into a major exhibition in 1912 and into philosophy, with both Karl Jaspers and Martin Heidegger leaving their mark on Van Gogh’s reputation and pressing him into service in a culture quite different from the Anglo-American appreciation of his work.